Entanglement is an intriguing consequence of the laws of quantum mechanics. If two particles are entangled, their identities merge: their joint state is precisely determined but their separate identities have disappeared. Entangled particles behave as a single entity even if they are far removed from each other. Einstein did not believe this prediction and referred to it as 'spooky action at a distance'. Entangled states form the heart of future quantum computers. In a quantum computer the building blocks – the quantum bits - can collaborate in a unique manner: by making use of entanglement they generate an enormous amount of computing power. A quantum computer with four hundred quantum bits already contains more bits of information than the number of atoms in the universe. In recent years, researchers have managed to entangle quantum bits with each other on a chip. Now this has been achieved with quantum bits on different chips. The research group of FOM workgroup leader professor Ronald Hanson (Kavli Institute of Nanoscience, Delft University of Technology) makes quantum bits from electrons in diamond. They can set the spin (the direction of rotation which forms the 'zero' or 'one' of the quantum bits) of these particles, control it and subsequently read it out. The researchers have entangled two electrons that were separated by a distance of several metres. As the electrons cannot feel each other directly at this distance, the researchers used light particles to create the entanglement. They subsequently determined the spin states of both electrons. Although the spin direction of the separate particles was entirely random, just as quantum mechanics prescribes, the spin directions of the two electrons together were always opposite to each other. That was proof of the successful generation of entanglement. Besides yielding new fundamental insights, there are two reasons why the result, published in Nature, is important for radically new technologies. First of all, it is a significant step towards a quantum network that can link future quantum computers – a quantum internet. Secondly, this entanglement is a basic ingredient for the completely safe transmission of information by means of teleportation. In teleportation, information does not travel across the intervening space and so it cannot be intercepted. See the research group's website for further information and films. False-colour electron microscope image of one of the diamond chips (blue) that was used in the experiment. 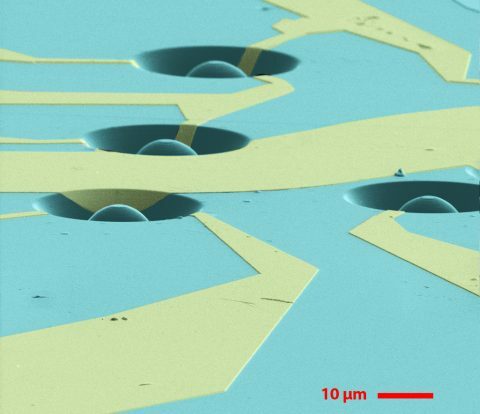 Nanolithography was used to make lenses precisely above an electron spin. The gold electrodes were used to control the electron.